Unable to complete his own education because of poor eyesight, Samuel Williston (1795-1874) nonetheless became one of New England’s most successful industrialists. His initial fortune derived from the manufacture of cloth-covered buttons, using a process developed by his wife, Emily Graves Williston (1797-1885). What began as a small cottage industry in the 1820’s rapidly expanded to employ more than a hundred households in the Connecticut Valley until, in 1848, Samuel built Easthampton’s first factory. By mid-century Easthampton was established as a thriving mill town, while Samuel expanded his interests into other textile industries, railroads, and banking. Samuel had always been passionately interested in education, and had contributed large sums to Amherst College and to the creation of Mount Holyoke College. Mindful that the Easthampton of his youth had been without schools, in 1841 he founded Williston Seminary, a coeducational school that featured two curricula: a classical division that would prepare students to go on to university study in law, the ministry, and similar fields; and an innovative scientific division to train students with no expectation of higher education for work in such professions as engineering and surveying. With the rapid industrialization of the United States and the country’s expansion westward, persons with this kind of background were in great demand. The school was located on Main Street on land now occupied by Bank of America and the Easthampton Savings Bank and Big E’s Market. There were four large buildings, including the United States’ first secondary school gymnasium (1863). (A painting of the Old Campus hangs at the east end of the Birch Dining Commons in Ford Hall.) Our present campus was originally farmland belonging to Samuel’s father, the Rev. Payson Williston. In 1843 Samuel built a large residence on the property. Today the building houses the school’s Offices of Admission, Communications, and Advancement. 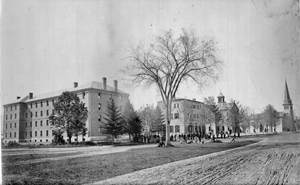 Williston Seminary remained coeducational until 1864, when Samuel built Easthampton’s first public high school (still standing at the end of Main Street, housing retail businesses). We would be an all-male institution for the next century. The Seminary, renamed Williston Academy in 1924, saw significant growth under Headmasters Joseph Sawyer (served 1896-1919) and Archibald Galbraith (1919-1949). However, although the Homestead property came to the school in the Willistons’ estate, finances delayed its development until the construction of Ford Hall in 1916 and the Recreation Center (now the Reed Campus Center) in 1930. Students walked between the two campuses until 1951, when the construction of Memorial Dormitory and the renovation of a former textile mill (the Robert A. Ward Schoolhouse) enabled consolidation on the present campus. 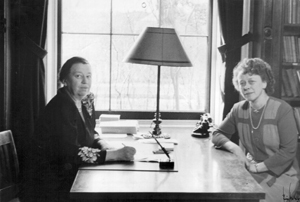 Meanwhile, the 1920 closing of the Capen School in Northampton inspired two of its teachers, Sarah Whitaker and Dorothy Bement, to found a school of their own. The Northampton School for Girls opened its doors on Pomeroy Terrace in 1924. Neither the Great Depression, severe floods, nor wartime deterred them from creating a program that emphasized academic excellence and social simplicity. A close relationship between Williston Academy and Northampton School for Girls developed in the 1930’s, first with dances, then with joint theater and music events. In 1967 girls appeared in Williston classrooms for the first time in 103 years, as the schools began to share a few academic programs. Williston Headmaster Phillips Stevens (served 1949-1972) considered coeducation an inevitable step in the school’s evolution, while the Northampton School trustees, concerned about financial viability, sought a solution for long-term survival. Negotiations for combining operations began in the late 1960’s. In September 1971 The Williston Northampton School opened as a fully coeducational institution. In the ensuing decades, Williston Northampton has continued to seek excellence in its academic, athletic, and extracurricular programs and to enhance its physical plant. For more information on school history, please consult Archivist Richard Teller ’70, (413) 529-3288. Your comments and questions are encouraged! Please use the space below. Thanks, Rick. Your stories are always enjoyable.